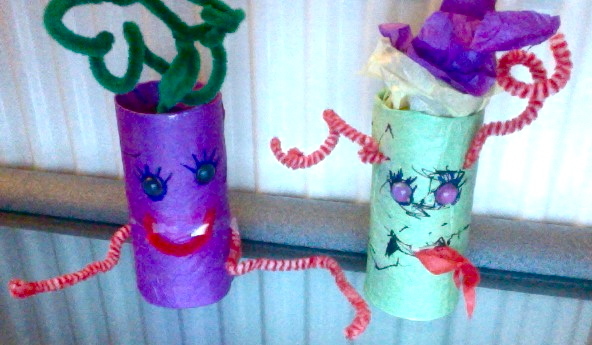 We made this fab toilet roll monsters yesterday. I was trying to think of a halloween activity to do, but we only had about 45 minutes to spare so I didn't want anything messy or complicated! These were super simple and lots of fun! Jake is only 22 months so I had to help a fair bit, which is why there are no photos of us actually making them - I was much too busy! But he still enjoyed choosing the colours and materials, sticking on the eyes (and pulling them off again), playing with the pipe cleaners and drawing all over the paper! He also has some plastic pretend scissors which he was clearly trying too use as he watched me cutting (time to invest in some proper toddler scissors I think). It was also Jake's idea to stuff tissue paper into the monster's head to make the big hair!